Our cat was diagnosed with mouth cancer 3 months ago. He had a huge tumor in his mouth and lost all of his top and bottom teeth on the left side of his mouth. We decided to give him the colloidal silver hydrosol that we have used regularly for health in our house for years. To our amazement, after a few weeks of using the colloidal ionic silver, most of the tumor has shrunk and fell off of his gums! I highly recommend this product for animal use. We now give it to our dogs and other cat. I also recommend this to my patients with various ailments. Although not a "one size fits all" it has helped many of my patients cure problems that modern medicine and pharmaceuticals can't. 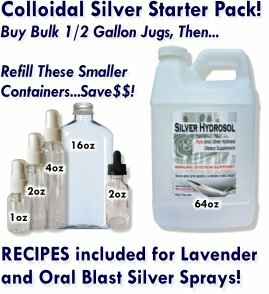 Does Belgium customs allow colloidal silver shipments? How many Drops - I don't have a spray - can I give my cat with the same cancer as your cat. Hello, what a wonderfull news! Hapy that your sweet cat made it. Thanks for sharing your story. My cat has the same problem. I want to know how many Drops are recommended daily? I have a bottle wit Drops. I didn't know that there was another form. I will have to search on internet where I can buy a good spray. I live in Belgium. But in the meantime I could administrate the Drops. When they tumor shrunk was there and hold on his mouth. You didn't use Manuka Honeywell of Castor oil to prevent any infections? Thank you for sharing your experiences with our product! IMO, as I'm not a scientist nor medical professional, I simply see nature as deeply intelligent. We all can agree there. But if we can say nature is intelligent, then it must be the collective intelligence of all that makes up nature. So everything must have its own intelligence and my impression of silver is that it's among the most intelligent. Seriously, how else would an ionic mineral know how to navigate the body, looking for pathogens while ignoring the rest?